Health and Human Services Commissioner Jeffrey Meyers explains the fine points of the new five-year contracts with managed care companies to executive councilors Wednesday while Gov. Chris Sununu looks on. CONCORD — The Executive Council voted 3-2 to grant a pardon hearing to a Lebanese immigrant facing deportation at Wednesday’s meeting. Alain T. Ata, 34, who owns Ataboys Auto Services LLC in Manchester, sought the pardon because he wants to remain in the country and work to help support his elderly parents and continue his life with his fiancee. Ata was sentenced to two-and-a-half to five years in jail and served over two years before he was paroled. 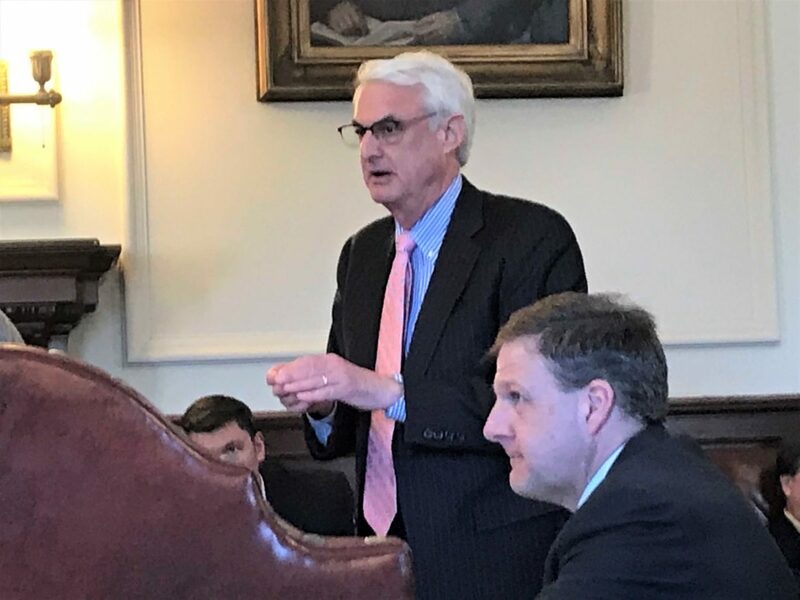 Councilors Michael Cryans, D-Hanover, Russell Prescott, R-Kingston, and Andru Volinsky, D-Concord, voted for the pardon hearing, while Debora Pignatelli, D-Nashua, and Ted Gatsas, R-Manchester, opposed it. Pignatelli said after the meeting she views a pardon hearing as an act of executive grace, which means a person requesting a pardon has done something outstanding like running into a burning building to rescue children. Gatsas said he looked at Ata’s record and does not think a hearing would be appropriate. Ata, his siblings and his parents left war-torn Lebanon in the mid-1980s. The other members of his family have become United States citizens, but he has not due to his conviction. The Rockingham County Attorney, who prosecuted Ata’s cases, recommends against a pardon, saying Ata had additional criminal charges since his 2005 conviction, including two charges of threatening in 2008, a 2013 conviction for drunk driving with seriously bodily injury, and a 2017 violation of an abuse prevention order. The pardon hearing is scheduled for April 10. Three managed care insurance companies will provide medical and mental health care to 180,000 state residents on the Medicaid program for the next five years. The three managed care companies will receive about $1 billion annually to care for the state’s low-income adults, families and children, and the disabled after the council voted 4-1 to approve the contracts on Wednesday. Gatsas was the lone “no” vote. Gatsas said no one asked the companies if they could provide the required services for less administrative costs and lower profits. Gatsas questioned Health and Human Services Commissioner Jeffrey Meyers about the current contract with one of the providers and what he sees as excess money that should be returned to the state. Meyers said the requirement that the managed care companies spend at least 85 percent of what they are paid for medical care was not in the original contract but is in the three voted on Wednesday. The requirement is a state law and tracks federal law in the Affordable Care Act. Meyers said the new contracts require more from the managed care companies, including focusing on high-risk patients and coordinating their care. “We believe we have cost effective contracts that will really improve the program significantly,” Meyers said. Lisabritt Solsky, executive director of Well Sense, one of the three companies, told reporters after the meeting her organization is a non-profit so any money that is not allocated does not go to stockholders, but is invested back into the company. Other councilors said they were satisfied the contracts were in the state’s best interest but were also concerned about the the Trump administration’s efforts to repeal the entire Affordable Care Act. Meyers said the case is currently before the appeals court, but would take some time to resolve. But he said repealing the ACA would have a significant impact on the state and other states as well. During the meeting, Volinsky asked Sununu to consider joining other states that challenged the lower court ruling saying the act is unconstitutional, but Sununu said later the time to join the states challenging the ruling has passed. The three companies selected for the new, five-year contracts are Boston Medical Center Health Plan Inc. or Well Sense Health Plan, Granite State Health Plan Inc. or New Hampshire Healthy Families, and newcomer AmeriHealth Caritas New Hampshire, Inc. of Philadelphia. The contracts were originally to begin July 1, but under the current time line are expected to become effected Sept. 1. Generally the federal and state government share program costs along with counties and school districts. Under the Medicaid expansion program, the federal government pays 90 percent of the cost and the state 10 percent. About 50,000 residents are in the Medicaid expansion program, which began with private insurance coverage, but this fiscal year switched to the traditional Medicaid managed care system.